There are countless examples of notable and stylish female cat owners (and men, more on these in future posts). 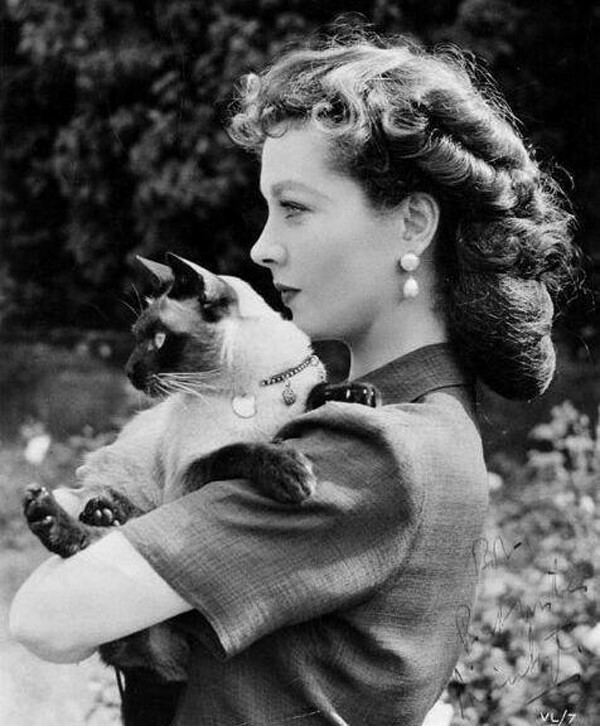 The late, beautiful, Anglo-Indian actor, Vivien Leigh is a fine example, owning a number of cats in her lifetime. For much of her adult life, Leigh suffered from bipolar disorder – cats are well known for their calming effects, particularly useful for those suffering from depression and Leigh's treasured companions may have helped her through difficult, dark periods. At the beginning of her marriage to fellow actor Laurence Olivier, she adopted a small black and white stray who she named Tissy. She later became the owner of a Siamese called New Boy. "Once you have kept a Siamese cat you would never have any other kind. They make wonderful pets and are so intelligent they follow you around like little dogs", she once said. Siamese are one of the first distinctly recognised breeds of Oriental cat, with a triangular shaped head, pointed features, piercing blue eyes and large ears. They are slim and small-framed with cream-coloured fur, with darker points at the ears, face, tail and toes. Siamese are usually very affectionate and intelligent cats, renowned for their social nature, often bonding strongly with one person. Some are extremely vocal, with a loud, low-pitched voice, known as Meezer. These cats are typically active and playful, even as adults, and are often described as more dog-like in behaviour than other cats. Leigh's New Boy (New for short) was a gift from her husband in 1946 and was named after London's New Theatre (now the Noel Coward Theatre in St Martin's Lane) where Olivier frequently performed. New was one of her favourite cats and would regularly travel with the couple to the theatre as a good luck charm and would stay in their dressing rooms. He was the most photographed of her cats and cited in the press numerous times between 1946-47. He wore an elegant collar ornamented with bells which was a gift from Laurence purchased in Paris. Sadly, New was run over by a car in 1948 when the couple were in Australia performing with the Old Vic Company. Fully aware of her deep grief, Laurence purchased a new Siamese kitten called Armando, who had a dark face like New and wore the same bell collar. Poo Jones, a well-mannered smoky-white Siamese cat with beautiful violet eyes and black feet and nose, lived with Leigh in the 60. He was named after Jones Harris, young admirer of Miss Leigh (son of actress Ruth Gordon and Broadway producer Jed Harris). Leigh adored his presence and allowed Poo Jones to sleep on her shoulder. He also travelled with her, even accompanying Vivien on the Queen Elizabeth, enjoying daily walks on the boat deck. At the theatre, Poo Jones would sleep during the acts and wake up just before his owner returned to her dressing room. After Leigh's death from tuberculosis on July 7 1967, Poo Jones lived with her housekeeper, Mrs Mac and later Peter Hiley. With special thanks to Kendra Bean of vivandlarry.com, a website dedicated to Vivien Leigh, Laurence Olivier, and classic cinema.